HOUGHTON — Is there a connection between a child’s exposure to violence and the escalation of violent events in our day to day lives? 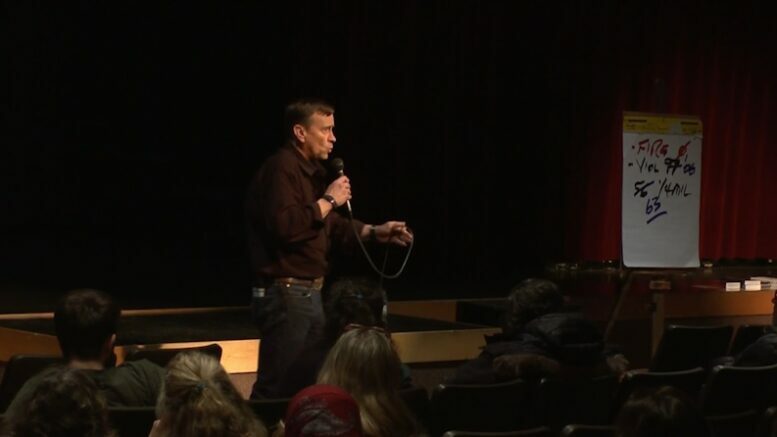 That’s the question that many parents had on their minds when they attended a discussion at Houghton High School that featured author Dave Grossman. Grossman is the author of the book “Assassination Generation” and shared his thoughts with parents as he outlined statistics and precautionary measures that parents can take. Retired US Army Lt. Col. Dave Grossman has written several books regarding to the phycological effects of killing, and how television and video game violence desensitizes a child’s regard for human life. During his presentation, he pointed out that not all children who play games like Grand Theft Auto become a mass shooter, but since the game’s release, all of the shooters involved in school shootings in the country reported excessive use of the game. These days Grossman travels the country training law enforcement on how handle active shooter situations and he also teaches parents that they play a key role as well. Until we attack this problem at the source, schools here in the Keweenaw, just like other districts across the country are tightening up security. Copper Country ISD is Installing electronic key entry doors throughout it’s buildings. The Hancock Public School District participates regularly in active shooter training. And local businesses have also received training on the matter. Grossman emphasized to parents that we can take a proactive approach as a society and it starts at home by limiting access to media violence. He even urges parents to take a 10 day media turn off challenge that he says parents will notice an immediate behavioral change in their child. Mass shootings are on the rise. And with life like graphics that today’s video games contain, his claims are worth investigating.